Honda will reveal the Civic Tourer “Active Life Concept” at this year’s Frankfurt Motor Show, underlining the Tourer’s class leading cargo space and versatility within the C-segment. The Concept study shows that style and space can work together; a custom paint colour further enhances the sleek and sporty exterior and an accessorised interior demonstrates the Concept’s suitability for an active lifestyle and the needs of its customers. Utilising the unique centre fuel tank layout, the Civic Tourer Active Life Concept makes full use of its 1,668 litres of boot space and a low loading height. Features include a smart loading rack capable of transporting two bicycles, along with a retractable arm which can be extended from the rack, making maintenance and repairs easier. 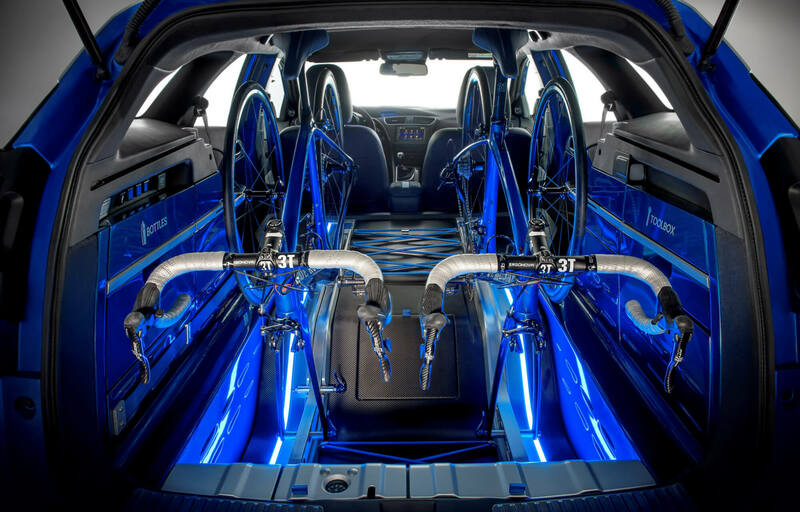 Other maintenance accessories include a built-in integrated air pump, a large light located on the tailgate, an extended shade area and a retractable bench making the Concept an ideal vehicle for cycling enthusiasts. Further accessories include a toolbox, bottle holder, water tank and a front wheel holder which are all integrated within the boot side lining. 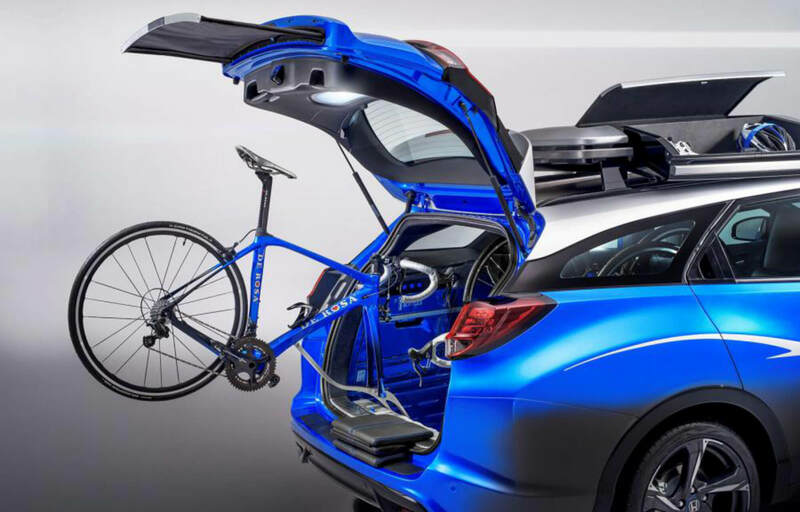 Other clever storage solutions include a special aero shape roof box designed to accommodate essential cycling accessories such as shoes and helmets. 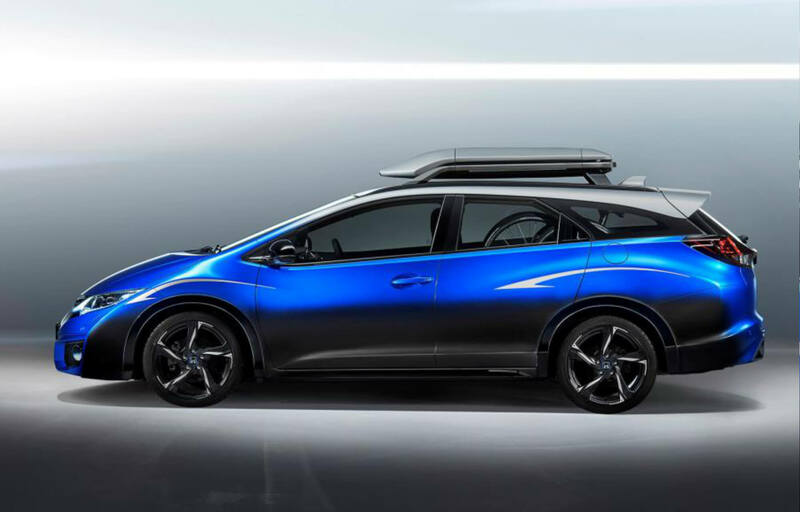 The dynamic exterior styling of the Civic Tourer Active Life Concept reflects the sporty and active lifestyle of the customer; featuring a custom blue paint finish with a lower gun metallic gradation and a silver roofline which help accentuate the Civic Tourer’s sleek styling and aerodynamic design. 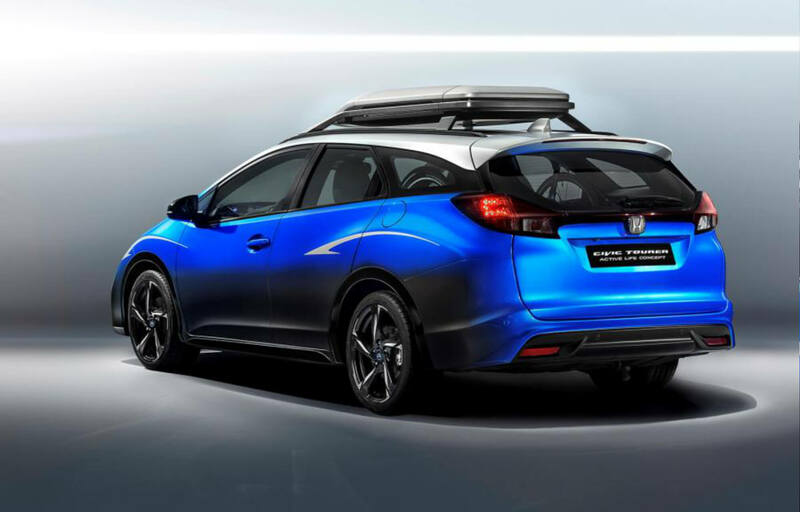 New 18-inch alloy wheels and a custom design rear bumper further highlight the Civic Tourer’s sporty characteristics. The interior also features a customised theme; blue stitching can be found on the steering wheel and on the gear shift, along with a sporty black roof lining, which is also found on the Civic Sport and Civic Type R. The front seats combine both suede and leather and feature a carbon tape with blue piping that runs along the centre and along the upper outer areas of the seat, continuing into the suede door lining. Of course, space doesn’t have to come at the cost of efficiency, and to demonstrate that belief, and proving in emphatic terms the efficiency of the new i-DTEC engines from Honda’s Earth Dreams Technology series, the Honda Civic Tourer 1.6 i-DTEC recently set a new GUINNESS WORLD RECORDS title for fuel efficiency. The 25-day ‘real-world’ challenge in June saw the car average 2.82 litres per 100km (100.31mpg) in a 13,498km drive across 24 contiguous EU countries. See the GUINNESS WORLD RECORDS title-holding Civic Tourer 1.6 i-DTEC and the Civic Tourer Active Life Concept, as well as Honda’s new model range, displayed at this year’s Frankfurt Motor Show at stand B11 in Hall 9.0 (15-16 September).